It's been a big couple of days for Windows Phones, but Windows Mobile 6.5 is still alive and kicking – at least until the Autumn, anyway. 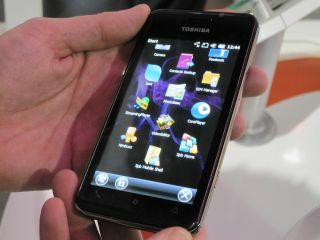 Toshiba has dropped the successor to the TG01 at Mobile World Congress and it's a beefy handset in terms of specs. The 4.1-inch WVGA touchscreen seems massive when you watch something on the screen, but the phone itself remains pocketable (just). Touch is now capacitive rather than resistive as on the TG01. Despite the beef on board, the handset is pretty thin at just 9.9mm. The finish is certainly more impressive than the TG01. The camera is unfortunately only 3.2 megapixels, however. Here's the main port - we're never sure about handsets that use these flappy things. After all, surely pushing and pulling a phone out of your pocket all day can't end well for them. The TG02 also doesn't have a headphone jack, which is a bit of a miss these days. One of our favourite features is the newly designed 3D menu system, which you can rotate around and get an overview of each screen on the handsets. The phone we played with was pretty quick. There's a Qualcomm Snapdragon 1GHz chip inside and you could speedily navigate around the screens. However, those little Windows Mobile niggles still came to the surface pretty quickly and our demo model also had a problem sorting out its orientation after we moved between screens. Hopefully this will be sorted out but that might take a little bit of Windows Phone 7 loving to achieve. Mind you, it wasn't clear if the TG02 packs the WinMo 6.5.3 update over bog-standard 6.5.